Trail rating is a difficult thing to do. Any time you personally attempt to rate something it is difficult to be completely objective because some of what you decide comes from your own experiences and opinions. However I've done my best to use a tried and true rating system and researched criteria on the IMBA website and also referred to a booklet called Bike Trails on the Sunshine Coast by Graham Macdonald (available at Off the Edge Adventure Sports and Spin Cycles). Something I took to heart was IMBA's suggestion to consider all the trails in a region and how they compare to one another and not to rate a trail in isolation. Something rated very difficult here on the Sunshine Coast might rate as easier on the North Shore trails and might be considered extremely difficult in another location. Here on the Sunshine Coast this holds true even for the different communities. 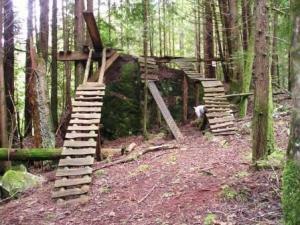 An example of a most difficult (advanced) trail in Halfmoon Bay would likely be rated more difficult (intermediate) in Roberts Creek or Sprockids Bike Park. These two areas have some of the most difficult, stunt packed, technical trails on the Sunshine Coast. In regards to a rating system for hikers I would recommend you use the rating system for biking, but adapt it for your own use and situation. I know from experience that a trail that is rated difficult for mountain biking is maybe only moderately difficult for a hiker, if at all. Generally what makes hiking difficult are obstacles and steep terrain. Having said this, there are exceptions. 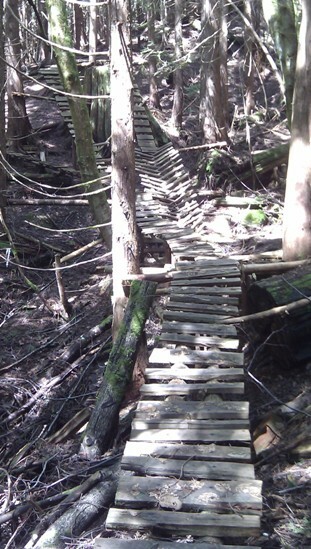 One example would be the trail called Seven Up in Roberts Creek. This trail is pretty much one wooden technical feature or stunt after another and in many cases there is no trail that goes around so you have to hike and climb the stunt or bushwhack. It is rated most difficult for bikers and would be the same for hikers. Read the descriptions carefully for this kind of information. Also I would suggest if you are not an experienced hiker and don't exercise on a regular basis, then follow the rating system for mountain biking more closely and stick to the easy and intermediate level trails until you increase your fitness level. Click here to return from the Trail Ratings page to the Sunshine Coast Trails Home page.